A cup of tea apparently solves everything and a good movie cheers everyone up but nothing says ‘comfort’ and ‘treat’ like a delicious serving of chocolate pudding! Maybe it’s because it remind us of being a child and getting a lovely chocolately treat after dinner. Or maybe it’s just that the delicious sweet taste is irresistible whatever the reason few of us can resist a chocolate pudding! Getting told you have a gluten allergy is not pleasant. You’ll be bombarded with information and you will have to cut a lot of products out of your diet but chocolate is not one of the things you can’t have! So why don’t you treat yourself and cheer yourself up by indulging in this great dessert. This pudding serves eight people so it’s perfect for a dinner party and is sure to get your guests talking. However it is so delicious you may not want to share it at all! To make this fabulously tasty dessert you will need 200g of dark gluten-free chocolate, 150g of butter, 2 teaspoons of vanilla extract, 200 ml of warm (not boiling) water, 100g of caster sugar, 4 eggs, 25g of rice flour, 1 teaspoon of gluten-free baking powder and a two pint pie dish. To begin with preheat your oven to Gas Mark 6 or 200C. So many people ignore the importance of preheating the oven but, when baking especially, it’s the only way to ensure the heat is what it should be when you put the pudding in the oven. Now for some preparation. Start by separating the eggs. A lot of people struggle with this and if you really can’t get the hang of it then you can always purchase an egg separator. These are pretty cheap and very easy to use. However if you want to do it without the separator here’s how to do it. First crack the middle of the egg light. If you crack it too hard you could break the yolk. Then take the half of the shell with the yolk in one and hold the other half of the egg in your other hand. Empty the contents of the shell without the yolk in into a bowl and set the shell aside. Next gently let the egg white run out of the half of shell with yolk in into a bowl, careful not to let the yolk out. Then tip the yolk into the empty shell you’ve set aside and empty the remaining egg white into the bowl. You can now pour the egg yolk into a separate bowl. Voila! Now break your chocolate into small pieces and add it to a heatproof bowl with the butter. Heat a pan of water and keep it simmering, place the bowl over the pans so the chocolate can melt. Once it’s melted take the bowl off the pan and add the vanilla to the melted chocolate. Stir and then add sugar and water. Mix until smooth, beat the egg yolks and add to the mixture. Add the baking powder and the rice flour and mix again until smooth. Now whisk the egg whites and then add to the chocolate mixture. 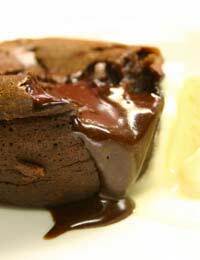 Grease your pie tin with a little butter and then add the chocolate mixture to it. Fill a water bath with hot water and put the pie dish in it. Place it in the over and cook for about 15 minutes. Turn the over down to Gas Mark 4 and now cook for a further 20 minutes. Finally remove from the over and serve piping hot with double cream. Delicious.